The Chinese e-commerce platform provider caught a case of the Singles Day blues. Shares of Baozun (NASDAQ:BZUN) lost 11.4% of their value in November, according to data provided by S&P Global Market Intelligence. The e-commerce company's stock sank after its reported that it sales growth rate for China's biggest shopping holiday was much lower than in 2017. Singles Day originated in 1993 as a sort of inverse Valentine's Day, but has evolved to become China's equivalent of Black Friday. This year, spending increased 31% from 2017, but that was a substantial growth deceleration that raised questions about momentum in the Chinese economy and the outlook for the country's e-commerce market. Baozun shares fell roughly 20% on Nov. 12 following news that Singles Day spending had come in significantly lower than anticipated. Sales had roughly doubled year over year in both 2016 and 2017, and the overall deceleration suggested that Baozun and other companies with significant retail exposure had seen weaker-than-expected sales. 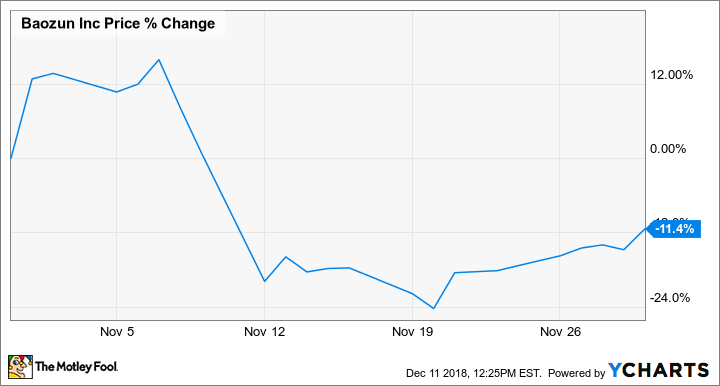 The stock price recovered somewhat after the company posted strong quarterly results on Nov. 20, but it still trades significantly lower than it did prior to news of the Singles Day slowdown, and is off roughly 48% from the high it hit this summer. Total net revenues for Baozun's September quarter climbed 24.8% year over year to reach $161.7 million; revenue from its services segment grew 48% to reach $88.3 million. Net income for the period came in at $4.3 million, up 35.8% compared to the prior-year period.